Meet Mc Desi. 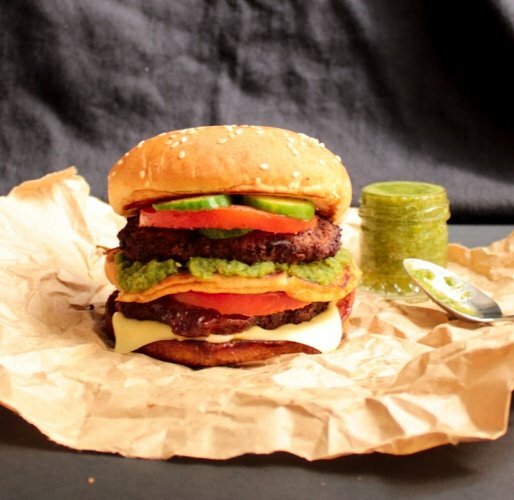 He’s a burger with a Pakistani flair. Doesn’t he look deliciously handsome? By the way, the word desi means local in Urdu. So what exactly are these yummy looking chappli kebabs, you ask? Chappli kebabs are beef patties which are super famous in Pakistan, especially in the northern area. They’re traditionally huge in size and served with steaming hot naans (flat breads). These kebabs get their name from the fact that they are shaped like a chappal aka a kind of traditional sandal. But don’t worry, no actual sandals are involved in the making of these kebabs. Only hands are used. Promise. These kebabs originate from Peshawar, a beautiful historic city of Pakistan.They are served at dhabbas (small roadside restaurants) and there’s nothing more comforting than sitting at a dhabba on a cold night. Add to that these chappli kebabs, naan, and of course tea served in small antique tea cups. If you read my other posts, you’ll see how I like my cup of tea. I’m kind of obsessed. Smaller versions of these are also made commonly in homes. Every mother has a slightly different recipe, depending on taste. But one thing is in common, and that is the deliciousness factor which breaks all records. Yeah, yeah I’m showing off my own recipe, but seriously try these! They are so good. Juicy. Spicy. Flavorful. From the outside they are crunchy-chewy and from the inside succulently juicy. They are really good with just a side of ketchup. But I wanted to take these chappli kebabs to another level, so I decided to make burgers with them. 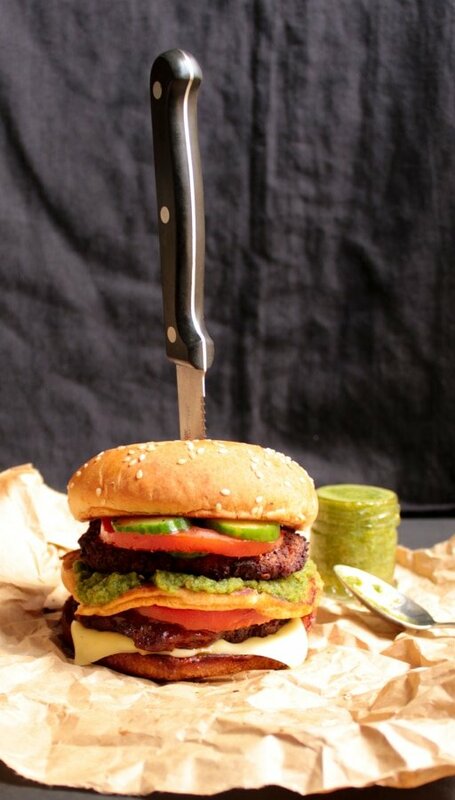 To add another Pakistani flair to these burgers, I decided to make a green goddess chutney to go along as a condiment. This chutney is so so so good. First of all. Look at how vibrantly beautiful that green is. And it’s got personality too, not just good looks. Its tangy, a little sweet, a teeny bit spicy, and a whole lot delicious. Okay, now let’s get down to the actual recipe. 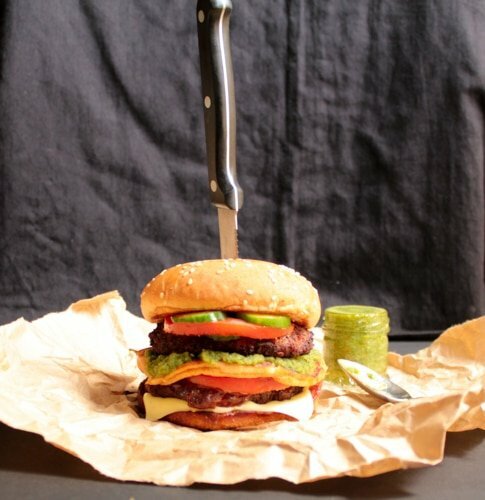 I know you’re dying to have one of these burgers! 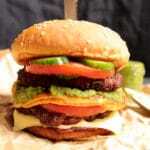 A double decker burger made from juicy spicy beef chappli kebabs and a to die for green goddess chutney. 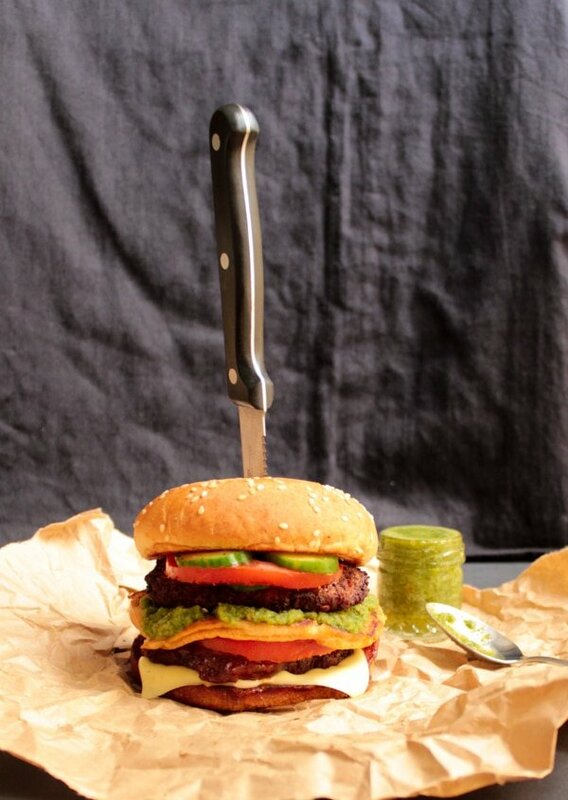 Move over plain old burgers, the Mc Desi is here to rock your burger-loving world! To make the beef patties, add the egg, finely chopped onion, cumin powder, coriander powder, green chilies, red chili flakes, garlic paste, ginger paste, chopped tomatoes, salt, black pepper powder, fresh coriander leaves, and dry breadcrumbs. Mix well and place in the fridge for half an hour. Make the patties in a round shape. Add 1/2 cup oil to a non-stick frying and put on medium heat. Add the patties gently and fry on each side until the color is nice and dark. Each side will take about 3-5 minutes. Preheat the oven to 240 C.
Line a baking sheet with foil and coat it with oil. Place the patties on the baking sheet and cover with foil. Bake covered for about 20 minutes and then uncover. Flip the patties a few times to make sure they are cooking evenly. The patties are ready when they become nice and dark. This will take about 45 minutes in the oven. Heat oil in a medium non-stick fry pan, and toast the buns on each side until toasted. Assemble the burgers and serve with a cold, tall glass of your favorite drink. *Chaat Masala is a tangy seasoning mix. It's easily available at Pakistani or Indian grocery stores. If not available, it can be omitted from the recipe.